Kicking off your summer by mixing fun with an open flame requires an abundance of caution, according to the National Fire Protection Association. Annually, grills, hibachis and barbeques are the source of 9,600 home fires, including 4,100 structure fires and 5,500 outside or unclassified fires. Emergency rooms across the country see some 16,600 patients for grilling injuries, including 1,600 children under the age of five suffering from burns. 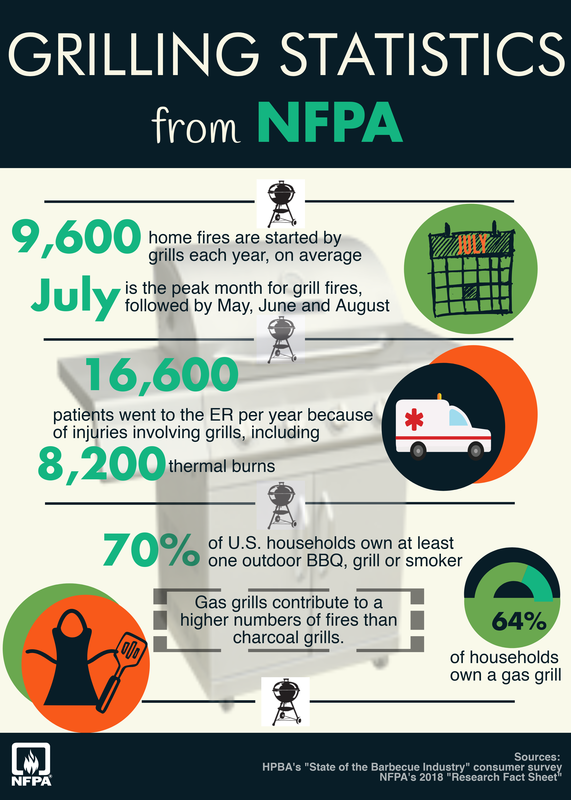 Fifty-eight percent of grill fires occur from May through August. NFPA recommends grilling a minimum of ten feet from structures, including buildings, balconies, and combustible materials. Fire pits should not be used within 25 feet of a structure or combustible material. Pennsylvania ingredients and natural spring water, combined by early German immigrants, built the foundation for today’s brew pubs and small breweries located across the Commonwealth, according to VisitPA. PA’s list of Top 15 Craft Brews begins in Pottsville with Yuengling Brewery, the oldest brewery in the U.S. Visit Appalachian Brewing Company, one of the largest microbrewery/brewpubs in the nation and the first in the Pennsylvania State Capital. Top breweries lie to the north, south, east, and west, as well as in central PA. Choose a region for your road trip, then see the lists of Pennsylvania’s Iconic Breweries and Taste Buds on Tour to plan your brewery experiences. Libre’s Law is intended to protect illegally tethered dogs from extreme temperatures in the summer, as well as winter, according to the Pennsylvania Department of Agriculture and Humane PA.
Libre’s Law, passed by the Pennsylvania Legislature in 2017, restricts tethering to less than 30 minutes when the Fahrenheit temperature rises above 90 degrees and drops below 32 degrees. Whether you monitor a specially-erected bat box or seek out abandoned houses, barns, church steeples or occupied structures, the Pennsylvania Game Commission is seeking participants in the Appalachian Bat Count. Interested participants will count bats as they exit their summer roost at dusk beginning in June using the Appalachian Bat Count Protocol and Survey Forms. You may choose to conduct one count, preferably in mid-July. Increase your commitment to at least one count every one to two weeks through July 31. The forms help you select the number of counts and preferable dates through August 1. During summer, White Nose Syndrome (WNS), does not grow on bats. Since the 2008 Pennsylvania discovery of WNS and its negative impact on hibernating bats, the PGC recommends no recreational caving from October 1 through April 30. Consuming as many as 2,000 insects every night, bats perform an important environmental and economic function. From avoiding scams and identity theft to preparing for big purchases while maintaining your retirement planning, the Pennsylvania Department of Banking and Securities distributes brochures and conducts free programs and presentations to help consumers achieve their financial goals. The Department’s Investor Education and Consumer Protection brochure outlines programs, presentations, and information aimed at the average consumer, as well as students and senior citizens. Review the Department’s upcoming calendar of events to attend a conveniently scheduled presentation or program. If you are unable to locate an event to meet your group’s needs, schedule a presentation for an upcoming meeting or conference through the Consumer Outreach Liaison at 717-214-5565 or by email at katrboyer@pa.gov. The smelly commotion brought on by the discovery of a Brown Marmorated Stink Bug crawling up your wall is about to descend upon your home again this year, according to the Penn State Extension. Warm weather offers a convenient opportunity to mechanically exclude the pest from your home. Start by purchasing good quality silicone or silicone-latex caulk for your project. Approach the task as a weather-proofing plan for your home. Fill the cracks around windows, doors, siding, utility pipes, behind chimneys, under fascia, and other openings. Inside, the Extension encourages looking for cracks and crevices under or beside baseboards and around window and door trim. Space around exhaust fans and ceiling lights frequently attracts stink bugs. Remove the rogue stink bug in your home with one part dish detergent to two parts water mixed in a spray bottle. Pesticides are ineffective in ridding your property of the stink bug.